FarmBoy and CityGirl hit Asia: How to send Korean text messages! 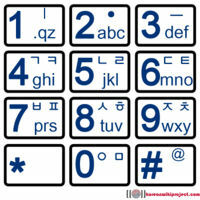 How to send Korean text messages! I have just stubled upon a really great website for learning Korean. It is affiliated with the wonderful TalkToMeInKorean, and is called the Korean Wiki Project. 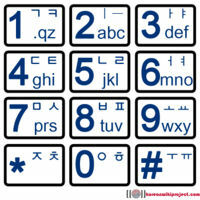 For those out there that have a Korean phone and feel compelled to send a text message (sms) to a friend in Korean but have been unable to find all the letters, heres some really useful info!! Anycall and EVER (brand) phones use •, ㅡ and ㅣ to create vowels when text messaging. Sky™ (brand) phones have a different style of text messaging. Unlike the standard way, you don't use • and ㅣ to create vowels.